The Subaru Forester is one of the most important and celebrated models in the brand’s lineup. In a world teeming with compact crossover SUVs, the Subaru Forester was one of the first and has been chugging along without much fuss since its global debut back in 1997. 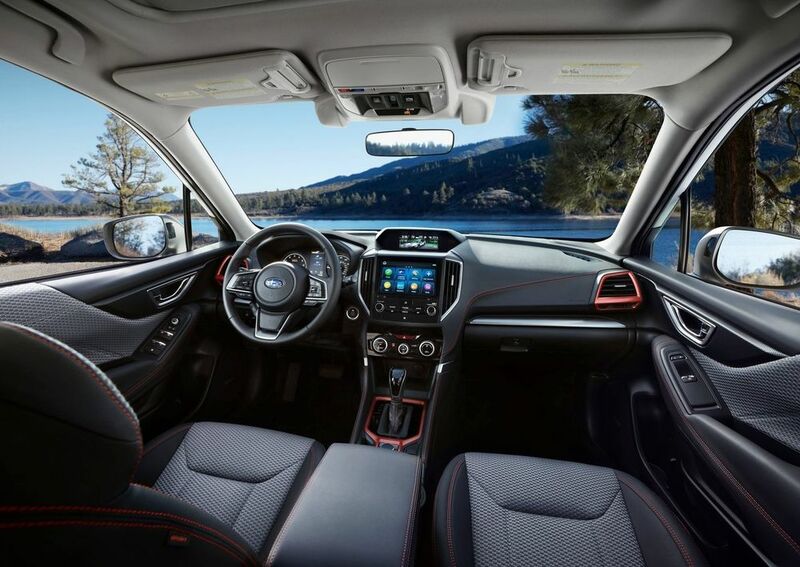 While the earlier generations of the Forester used the old Impreza platform, the new fifth-generation model has moved on and is underpinned by the brand’s latest Subaru Global Platform architecture. Compared to some of its rivals, the Subaru Forester not only retains more of its SUV-like style, but it also costs less. And unlike the Nissan X-Trail, but just like most others in its class, this Subaru is only available as a strict five-seater in the UAE. 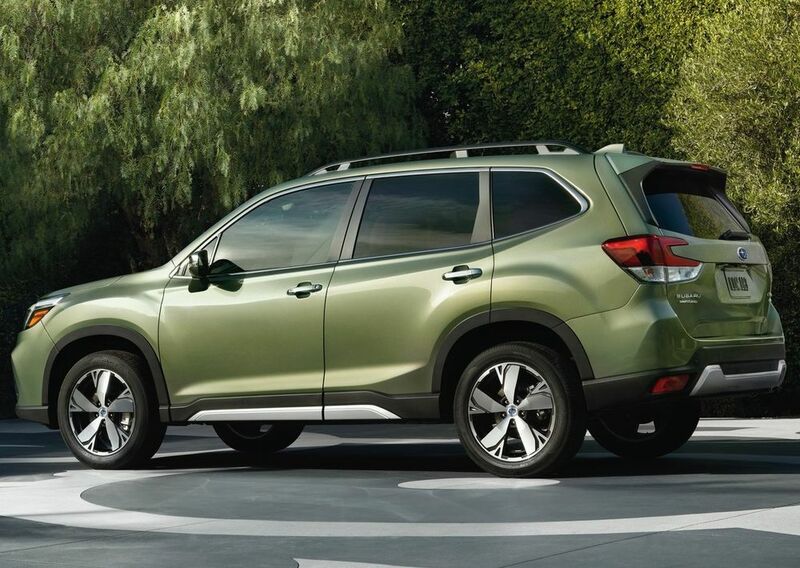 Apart from the Nissan, the 2019 Subaru Forester’s battlefield includes the Toyota RAV4, Honda CR-V, and Ford Escape. If you consider some of its competitors as looking too soft, the Subaru Forester’s more boxy and upright stance will be surely more appealing. Subaru seems to have blended old-school styling with new-age technology quite perfectly with the new Forester. The front fascia looks intimidating and well-proportioned with Subaru’s signature hexagonal grille flanked by sweptback “hawk-eye” design HID headlights, well-contoured and muscular hood, and a beefy bumper with vertically-aligned faux intakes and halogen foglights with chrome surrounds. 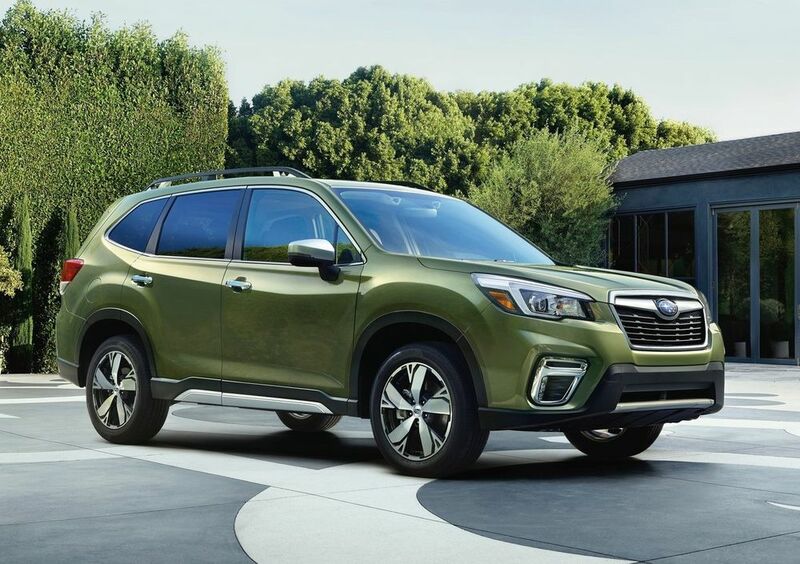 Chief design highlights along the side of the Forester include the flared fenders, stylish 18-inch rims, large windows and roof rails, and protective side skirts. The boxy theme continues over to the back, where there is a pair of clear lens taillights with LED elements, large roof spoiler and rear glass, and twin exhaust pipes. The 2019 Subaru Forester comes in at 4.595 meters long, 1.796 meters wide, 1.686 meters tall, and its wheelbase stretches 2.640 meters between the axles. It also comes with a practical and deep boot that can hold up to 974 liters of cargo. Owing to its boxy silhouette, the 2019 Subaru Forester’s interior boasts of excellent space for five adults. It’s also well-built and quality of materials is more than decent, save for some scratchy plastics lower down in the cabin. And thanks to the large windows, comfortable seats, and acceptable NVH levels, the Forester performs well as a long-distance cruiser. However, there’s nothing to write home about as far the design of this interior goes. The 2019 Forester comes pretty well equipped and as such, you’ll get a power tailgate, keyless-entry & go, a large power sunroof, leather upholstery, adaptive headlights with washers, rain-sensing windscreen wipers, dual-zone climate control, a power-adjustable driver’s seat with memory function, cruise control, a touch-screen infotainment display, and all-around parking sensors with rearview camera. The Forester’s comprehensive list of safety features includes a full complement of airbags, hill assist, stability control program, and ABS with EBD to name a few. The 2019 Subaru Forester gets a 2.5-liter naturally-aspirated four-banger that belts out 168 horses and 235 Nm of torque. Channeled via Subaru’s Lineartronic CVT gearbox to all four contact patches, the 1.6-ton Forester will hit 100 km/h in a smidge under 10 seconds, before maxing out at 196 km/h. As for its fuel consumption, the Forester’s score of 8.5 L/100 km is quite average within its class. In the UAE, prices for the 2019 Subaru Forester kicks off at AED 105,900 for the Premium variant, and goes all the way up to AED 115,900 for the fully-loaded Sport trim. Cost of insurance for the Forester starts at AED 1,651 for the base trim, whilst the top variant starts at AED 1,806.